Chris Baldick is Professor of English at Goldsmiths, University of London. He is the author of the Oxford Dictionary of Literary Terms (4th edn., 2015), and of several works of literary history including The Modern Movement (2004) and Literature of the 1920s (2012). Dirk de Geest is director of the research group MDRN, which studies literature’s multiple functions, histories and mediatizations in the modernist period. He teaches literary theory and Dutch modern literature at KU Leuven. His research covers a broad field of issues in 20th-century literature. His theoretical work focusses mainly on systems theory, the historiography of literature and discourse analysis. Currently, De Geest is preparing a book on the history of postwar poetry in the Flemish literary context. Lise Jaillant is currently Research Associate at the John Rylands Research Institute, University of Manchester. In February, she will take up a permanent position as Lecturer in English at Loughborough University. She specialises in 20th century literary institutions, with a special interest in publishers and creative writing programmes. She is the author of Modernism, Middlebrow and the Literary Canon in the Modern Library Series, 1917-1955 (Routledge, 2014) and her second monograph Cheap Modernism: European Publisher’s Series and the Avant Garde is currently under review. More information can be found on her website: lisejaillant.com. Tom Perrin is Assistant Professor of English at Huntingdon College in Montgomery, Alabama. His book, The Aesthetics of Middlebrow Fiction, was published by Palgrave Macmillan in 2015. His work has also appeared in American Literature, NOVEL, the Times Literary Supplement, Public Books, and elsewhere. Pieter Verstraeten works as a postdoctoral researcher at the University of Groningen. His main research interests are the literature and culture of the interwar period, the history of the modern Dutch novel, middlebrow literature, and the interactions between literature and material culture. Adriaan van der Weel is Bohn extraordinary professor of Modern Dutch Book History at the University of Leiden, Book and Digital Media Studies. His research interests in Book Studies concentrate on the digitisation of textual transmission and reading; publishing studies; popular reading; and scholarly communication. He is editor of a number of book series on these subjects, and European articles editor of Digital humanities quarterly. His latest books are *Changing our textual minds: Towards a digital order of knowledge* (Manchester: Manchester UP, 2011), and *The Unbound book* (Amsterdam: Amsterdam UP, 2013), a collection of essays edited jointly with Joost Kircz. He is vice-chair of the COST Action ‘E-READ’, about the future of reading in the digital age. Emma West is an AHRC-funded doctoral candidate at Cardiff University. Her interdisciplinary thesis, The Highs and Lows of Modernism: A Cultural Deconstruction, uses critical and cultural theory to interrogate and reconfigure the modernist high/low culture divide, developing new ways of studying texts from across the cultural spectrum. She has published several essays on modernism and fashion and modernism and theory. In 2013, she organized Cardiff University’s Alternative Modernisms conference; since 2012 she has been a founding committee member of Modernist Network Cymru (MONC). * Due to circumstances, Ann Ardis and Nicola Humble will not be able to attend to conference. Stephan Besser is Assistant Professor of Modern Dutch literature at the University of Amsterdam and programme director of OSL. His research focuses on the poetics of contemporary neuroculture and the relations of literature, culture and science in general. He is the author of Pathographie der Tropen: Literatur, Medizin und Kolonialismus um 1900 (2013) on constructions of the tropics in German colonial culture. Kate Macdonald is a literary historian and a specialist in British book history and publishing culture, 1880-1960. She has a background in academic publishing, but moved back to research some years ago. She has taught British cultural history, literature (especially poetry for beginners), and creative writing in several European universities, including Ghent, Paderborn, Tartu and Nijmegen. Meriel Benjamins is a PhD student at the University of Groningen. In her dissertation she analyzes how cultural intermediaries – critics, publishers or essayists – negotiated different values and explore the at times almost seamlessly combined action of literary, social and commercial mainsprings that helped to shape modern reading culture. Erica van Boven is professor of literature at the Open University (The Netherlands) and associate professor of modern Dutch literature at the University of Groningen. Her research focuses on Dutch literature and literary criticism of the interwar period with special interest for middlebrow and gender. Her most recent book is Bestsellers in Nederland 1900-2015 (Garant 2015). Ryanne Keltjens completed a Research Master in Literary and Cultural Studies (with distinction) at the University of Groningen, the Netherlands. 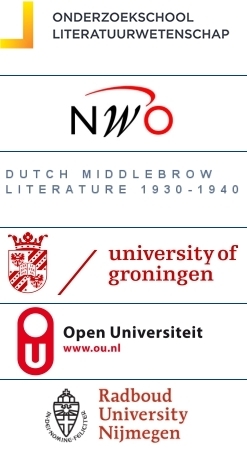 The dissertation she is preparing explores the multi-faceted domain of Dutch middlebrow criticism in the interwar period. Her research interests include popular literature, (literary) periodicals, the functions of literature for readers, author representations, literary hierarchies and canon formation. Alex Rutten is a PhD student in Literary and Cultural Studies at the Open University in the Netherlands. In his research, he focuses mainly on literary criticism and cultural mediation during the interwar period. Currently, he works on a biography of the Dutch (radio) critic, writer and journalist dr. P.H. Ritter Jr.
Mathijs Sanders is Assistant Professor in Literary and Cultural Studies at Radboud University (Nijmegen, The Netherlands). He wrote his doctoral thesis at Utrecht University on concepts of literature of Roman Catholic Dutch authors from the period 1870 to 1940. His research focuses on Dutch literature from the interwar period in a European context and on the institutional dimensions of middlebrow literature and criticism.